It’s creaky and it’s kooky, mysterious and spooky. But there’s no denying it – Halloween is now a major event in the marketing calendar. Especially in America where the big brands and universities go into overdrive. Whatever your thoughts about Halloween, it’s a big opportunity, as today’s marketers join in the fun and tap into and provide life experiences rather than trying to overtly sell. You only have to look at the images on your Facebook timeline to realise that people are more than happy to get into the spirit of things and share pictures of their pumpkins, costumes and parties. Unfortunately, this year has seen some tasteless costumes and party themes at universities. And Halloween didn’t even register in the social media strategies of some of the UK’s most haunted universities (not even a change of cover image). However, there’s plenty of good stuff out there from scare tactic stunts to fancy dress and pumpkin carving competitions. So, here’s a quick round up of some of our favourites. When you’re marketing a scary ride for a theme park, it makes sense to take the scary experience to your audience. So, Grona Land built a special poster that was the public’s worst nightmare. They may have only engaged with a few people in Stockholm, but the YouTube video has received 750,000 hits in just 2 weeks. Halloween is the perfect opportunity to showcase the talents of students taking a module in horror performance. So over 40 USW students took the university experience to their local community and put on a spooktacular performance in the heart of Cardiff. Watch it here. OK, so these aren’t strictly Halloween stunts, but they certainly have the shock factor. Famous ambient stunts for the films Carrie and Devil’s Due have been watched by millions. 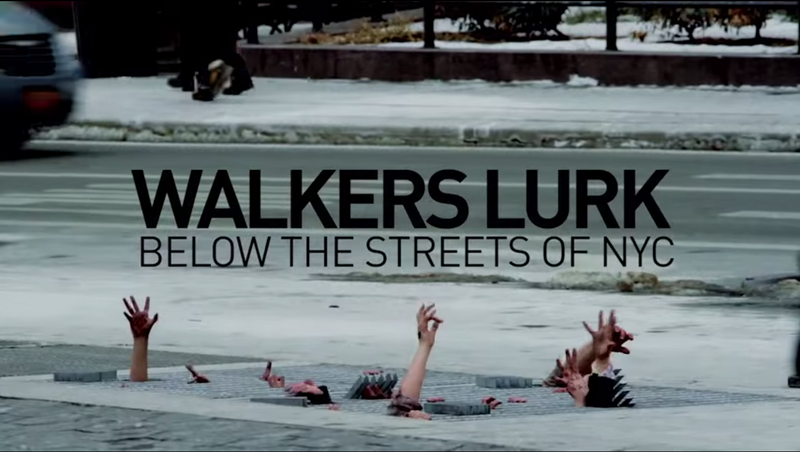 But we prefer this Augmented Reality poster to advertise the Walking Dead in Austria and underground zombie stunt to promote the same programme in New York. Not for the faint-hearted. But great fun! As the Editor of the Walking Dead comes from Full Sail (as do many of the industry’s finest) they entered into the spirit of things more than most. Their President gave an unusual ‘Happy Halloween’ message thanks to their film make-up students. While one of their successful graduates helped people to create some killer special effects for Halloween through some video tutorials. If you take a look at their Facebook page, their Halloween costumes are pretty special too. Can your knowledge of maths help you survive a zombie invasion? The academics at Oxford think so with an insightful blog piece about Mathematical Modelling of Zombies. It’s well worth a read – just in case. A great example of newsjacking too! While on their Facebook page, they also took the time to educate us and remind us what Halloween is all about. Zombies were a big theme this year, as Samsung got their customers to take a closer look at their big screens and then scared the pixels out of them. An experience they certainly won’t forget in a hurry. A great video and as viral as the zombie. Personally we think clowns are a bit creepy at the best of times, but Pepsi certainly took their scare tactics to the max by turning people into clowns, werewolves and all kinds of scary monsters with their magic mirror. Take a peek through your fingers for yourself. Over at The Open University, they educated their students by talking about the origins of zombies with a special Facebook live chat. And reassuringly they also talked about our chances of surviving a zombie apocalypse. We like the idea of laying low while the birds eat them. But we don’t fancy the idea of zombie birds. When trouble starts it makes sense to head for the safety of a car rather than that spooky looking house on the hill and the creepy guy with the spade. A point made rather nicely by Ford who showed off the ruggedness of their car with the aid of a monster car wash. No monsters were harmed in the filming of their prank. This is a simple but brilliant idea that is more Monster Mash than Monster Wash – a Halloween playlist created on Spotify and shared on Facebook so students can play it around the campus. Whether you’re big on News-Jacking or just want to connect and engage with current and future students in brand new ways – we hope you’ve enjoyed our fun Halloween round up. We hope you’re inspired to do something a bit special next year. At the Future Index we scour the internet to find the best sparks from around the world and inspire you with excellent marketing ideas and campaigns.